Looking for the best wedding car hire in Essex. 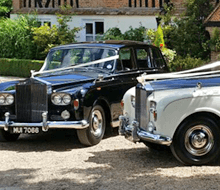 Call Bennetts wedding car hire the most recommended car hire for the Essex area. Thank you for making our day a special one, the wedding cars were absolutely beautiful and the driver was polite, well dressed and competent. It was wonderful to feel like royalty for the day. My husband to be and I chose this wedding limousine as we wanted something modern yet stylish, the chauffeur was lovely and the car was perfect. all in all a very professional wedding transport service. The Phantom VI was a perfect choice for our wedding. It was much more spacious inside than I imagined. The chauffeur was very friendly and prompt. I would highly recommend Bennetts Wedding Limousines for wedding day transport hire. We were so lucky to have the use of this beautiful limousine on our wedding day, it looked absolutely magnificent parked outside the church.